Rent directly from the Owners (Dawn & Eric) and SAVE as our rates are better than the condos managed by rental companies! Perfect Location... This quaint Timbernest condominium complex, of only 24 total units, offers a premiere location in the majestic, fun-filled village of Breckenridge, Colorado, where you can find World-Class skiing and snowboarding (an hour and a half from Denver International Airport or an hour from Eagle, Colorado airport). Our condo is nestled at the base of Peak 9, only 250 yards from the Quicksilver Lift (at one point was the World's Fastest Lift), and 300 yards to downtown Breckenridge. It is located on the ground floor (the picture above shows our ground floor entrance), so NO STAIRS or ELEVATORS! Families with small children or older family members will especially appreciate not lugging equipment & baggage up and down stairs. 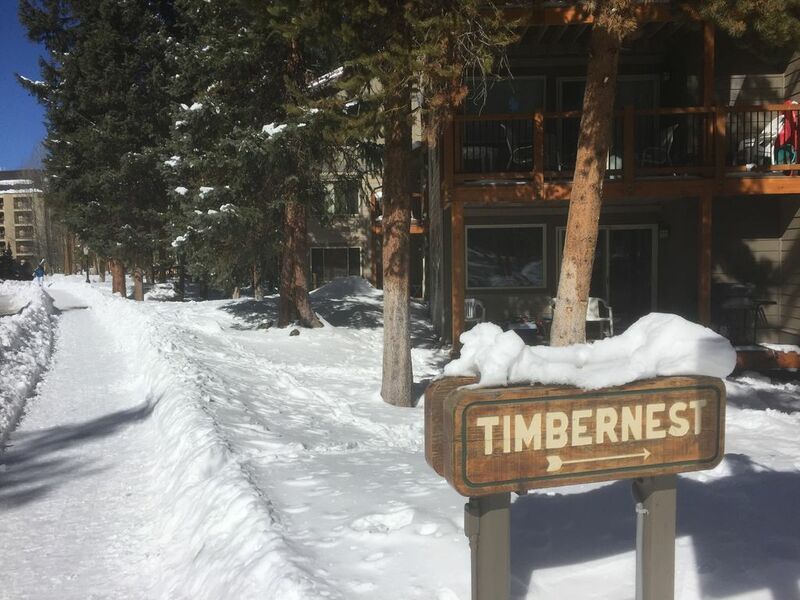 Forget about the car once here, our Timbernest condominium is located near the FREE bus route with stops around Breckenridge, and connections to Keystone, Arapahoe Basin, Copper Mountain, and Frisco. Driving distance to nearby resorts: 20 minutes to Copper Mtn, 30 minutes to Vail, 30 minutes to Loveland, one hour to Winter Park, and 1.5 hours to Steamboat. ENJOY YOURSELF. Visit the superb restaurants and unique shops of downtown Breckenridge. Play all day and then relax in the outdoor hot tubs. Warm up near the fireplace and watch cable television or perhaps a movie. A movie library (over 30 movies) and various board games are provided in the unit. If you enjoy shopping, the Silverthorne Outlet Mall is only 12 miles away. This unique and extraordinary condominium has been updated with traditional decor, it is truly your home-away-from-home. It can comfortably accommodate up to six people (queen-size bed, bunk beds, and queen-size convertible sofa sleeper). You can comfortably seat six people at the dining table and seat four at the kitchen bar. Our condo is perfect for a family vacation or even a cozy weekend for one or two couples. This is a lovely condominium that is ideal for that fun vacation you have always wanted. Enjoy the tranquillity of this mountain getaway. You will be happy you stayed with us! Please contact us if you have questions. Also, we will be more than happy to assist you with restaurants, ski rental, and ski information. During the 2018 Summer (through December 1, 2018), our pool and hot tub facility completed a complete renovation. We hope you enjoy the new facility! My wife & I bought our Breckenridge Condo as a gift to each other for our wedding in 1997 and have enjoyed it for many years. Our children have each learned how to ski (and sled) here and hope they teach their kids while staying there in years to come. We selected Breckenridge because we wanted a true town with world-class skiing. We chose this location due to the close proximity to the ski lift, downtown, and hiking across the street. We come to Breckenridge from Denver in our car and rarely get in it again once we arrive. There have been many times we have discussed getting another condo further away that can hold 3 or more families... but our location just keeps talking us out of it! There are too many benefits to list, but here are a few that we feel set us apart from other units: * Ground floor is fantastic. * Proximity to everything in Breck makes life easy! * Extra set of bunk beds gets kids off ground. * Extra rest-room in unit is very helpful. * Large common area for entertaining promotes togetherness. View more about Eric B. Parking passes for the lot are inside the unit to use during your stay. Our condo is only ~250 yards to the base of the Quicksilver ski lift! Our hot tub is only ~40 steps away from our deck! Short walk to quicksilver lift and breck. (5 minutes). Condo doesn't have much when it comes to usable cookwear as much of the teflon is scraped off. We made do w/ a usable wok and pot though. Basics are met. Brother said pull out sofa wasn't super comfortable so we just moved a mattress from the bunk bed in the bedroom to the living room. Spring beds could use an update. Bathroom is a little small. We enjoyed our stay in this condo! We were very fortunate to get 69 inches of snow the week that we stayed in Breckinridge. Several mornings that week the cars in the parking lot were buried in more than a foot of snow. Since we were able to walk to the lift we didn’t need to dig out the car. In fact, we didn’t really need to use the car at all that week with the hot tub located a very short walk from the unit. The renovations to the hot tub area are beautiful. We were able to do our own cooking that week in this condo. Condo is convenient!!! We loved the layout and the proximity to the lift. Eric was quick and responsive to our special requests. Thank you for the kind words. The location is one of the reasons why we (and others) love our condo. Hope you come back next year! My husband, daughter and I stayed here for 1 week and it was simply perfect for our basic needs. The location is great- a short walk to the Quicksilver lift. The kitchen is stocked with ample items for us to cook in. Comfortable living space with a large table for dining. The extra half bathroom was helpful and we appreciate the extra towels. The bedroom with the set of bunkbeds was helpful for our family. Thank you to Eric for his quick responses and help whenever needed. We are so glad you enjoyed your time at our place. Thank you! Great location—walking distance from downtown. Easy walk to the Village ski school and lift. Well-stocked kitchen. Games and DVD’s were a plus! Pull-out couch was very comfortable and bunk beds were useful. Heating system was a bit noisy during the night. Hot tubs/pool access just across the parking lot but unfortunatley they closed for renovations half-way through our trip. The only real complaint we have is not reflective of the condo itself, it's was about the building. We had alot of weird noises coming from he ceiling in the middle of the night that we can only explain as noisy pipes when our upstairs neighbors were taking a shower. Other than that the condo itself was excellent and the location is in such a great spot. Will def stay here again. Thank you for the response. Yes, there are extremely cold times in the winter when our baseboard heating throughout the complex "gets a lot of use" and guests can hear the water moving. We hope you were warm!